One of the best parts of the board is celebrating all of life’s joys with each other and that’s what a few of us are doing today. Carrie of Carrie’s Sweet Life is hosting a virtual baby shower for our sweet friend Amy of Amy’s Kitchen Creations! She is expecting a baby girl this month! Hip, hip hooray for baby girls! We are so excited for you! The theme of the shower is recipes for busy moms. Perfect! When deciding what to share today, I wanted the dish to meet two criteria: 1. Easy to make. No fussing around with tons of prep work or babysitting. I turned to the golden child of the too-busy-to-cook cook’s kitchen: the slow cooker! And 2. It should make a lot. Like a ton. So much you could eat it every night for a week. 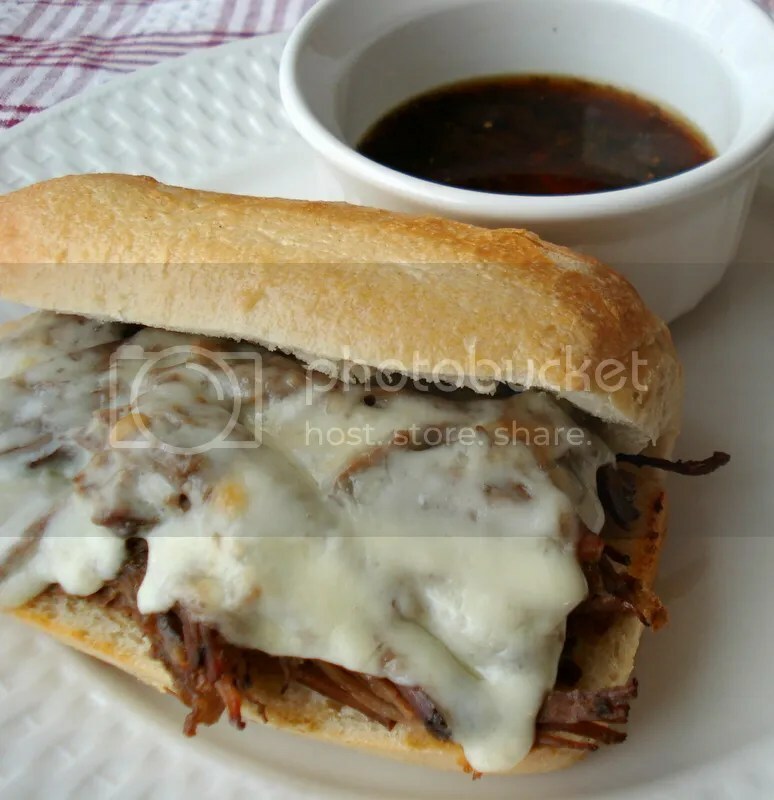 Considering how close I am to becoming a mom myself, these slow cooker french dip sandwiches were a great way for me to flex my supermom muscles and get tasty and easy dinner on the table and have enough leftover to stash in the freezer for a quick meal later on. Busy moms take note, this is about as simple as it gets. A large chuck roast is tossed into the trusty crock on a bed of a sliced onions. A flavorful mix of beef stock, soy sauce, garlic, Worcestershire sauce, and mustard is poured over the top. It’s left to simmer and at the end of the day you have tender shredded beef with a great dipping sauce to have on the side. Total active time about 12 minutes: 10 minutes to get the stuff in the crock, 1 minute to slice up some rolls, and 2 minutes to broil a bit of cheesy goodness on top. Another great thing about these sandwiches? Perfect for parties. Couples shower perhaps? Maybe to celebrate a perfect bundle-to-be? I’m thinking yes. Amy, congratulations again! We are so excited for you and we can’t wait to “meet” your sweet baby girl and welcome her into the “family.” Click on over to Carrie’s Sweet Life to see the full round-up of recipes for this wonderful celebration! 1 medium yellow onion, sliced into quarter inch rounds and the rounds kept in tact. Place the onion rounds in the bottom of the slow cooker. In a small bowl, whisk together beef broth, soy sauce, Worcestershire sauce, mustard, and garlic. Add to the slow cooker over the onions. Salt and pepper both sides of the roast and place on top of the onions. Cook on low for 6 to 7 hours or until the beef is fall apart tender. Once the meat is done cooking, transfer the roast to a cutting board and shred using two forks. Remove the onions and set aside. Strain the drippings into a large “defatter” measuring cup to get rid of the oil that collects on top (a mesh sieve works too). Heat the broiler. Place the split sandwich rolls on a lined baking sheet and toast for 1 minute or just until the bread begins to brown. Remove the tops from the pan. Scoop the shredded beef onto the bottom of the rolls and top with reserved onions (if desired) and cheese. Return to the oven just until cheese is melted, about a minute more. Top with sandwich halves and serves with small bowls of au jus. Yum!! These look so good!